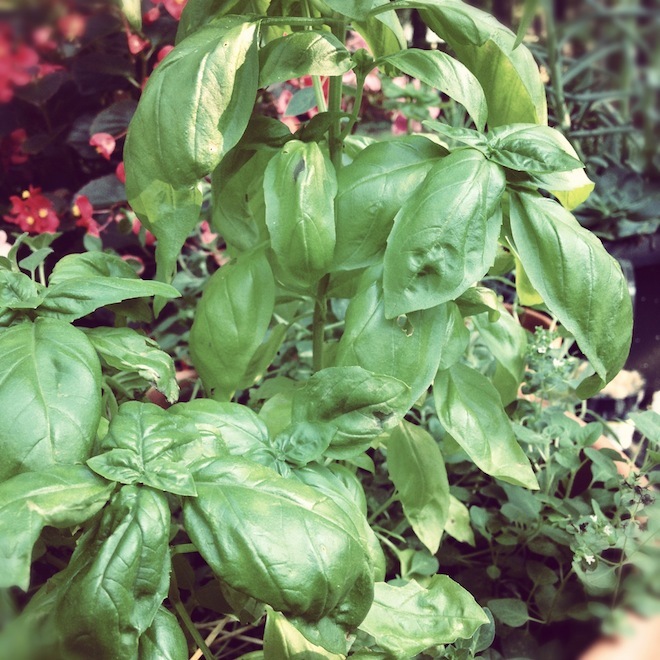 As summer comes to a close, the hot weather and humid temperatures mean that basil goes crazy. We grew ours from seed this year, and what started out as little tiny sprigs of fragrant smelling leaves are now threatening to take over the entire herb pot. Here in North Carolina, the weather is ideal. And while I won’t go all Isabella and her pot of basil on you, I will say that basil happens to be one of my favorite herbs in the world. I adore it. And the best way to keep basil tasty for a while, I’ve found, is pesto. If you can make a jar of pesto, you’ve got concentrated flavor and dozens of options. Whatever pesto recipe you use, it’s typically a combination of basil, oil, garlic, cheese (like Romano or Parmesan) and salt and pepper to taste. I like Jamie Oliver’s recipe but I use walnuts instead of pinoli (pine nuts) nuts because they’re much cheaper (I also adhere to his school of measurement–you know, “a handful” being my language). Got your pesto? Good. Now, you have no excuse. Here’s five simple recipes. Throw pesto on some chicken and bake. I’ve done this on frozen chicken from Costco to great results: halfway through the cooking process, just add a little pesto on top (about a teaspoons if you’re measuring) and put it back in to finish. The result is flavorful and moist. Zippy pasta sauce. I add about a quarter of a cup of pesto to my thawed spaghetti sauce recipe (I usually make a metric crap-ton and freeze it) and it really adds a lovely depth of flavor. And it’s especially nice toward the end of a big batch to mix things up a little. Isabella, or the pot of Basil originally appeared in the Decameron , a famous medieval Italian precursor to The Canterbury Tales . In the story, a woman’s lover is killed; she finds his body, takes his head, and plants it in a pot of basil. Her brothers discover this, do away with the head, and well, she dies of sorrow. As you do. It inspired poets like Keats and painters like William Holman Hunt.